Dear Mother Moon and Members of the Moon Family. Excellencies. Distinguished Guests. Ambassadors for Peace. Ladies and Gentlemen. It is my distinct privilege to pay tribute to Rev. Dr. Sun Myung Moon on the occasion of his passing into the spiritual world. On the one hand, this is a day of sadness, as we reflect on the loss of a man we all came to know and love. We could witness his absolute conviction and passion toward carrying out the will of God. He was always ready to risk his life for the sake of God’s Will. Mother Moon I know you must be very sad today. And at the same time, you must also be very proud to have loved and lived, side by side, with this great man of destiny for more than 50 years. You know him not only as your husband, the father of your children, or the great man of peace known around the world. You know the man who, as a young boy, was called by Jesus Christ to take up his mission to restore the world; to build God’s Kingdom; and establish a world of universal peace. You know the man who came to know the heart of God, and the man who came to embody the true love of God, as True Father. Together you stand as True Parents. I can think of no one who has devoted himself more thoroughly to the promotion of interfaith understanding and cooperation. Long before interfaith had become a mainstream idea, Father Moon had been its champion. 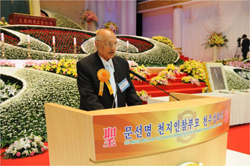 He has even called upon the United Nations to take interfaith more seriously and to establish an interfaith council within the United Nations system. Father Moon was no stranger to suffering and conflict. He witnessed first-hand the brutality of a North Korean communist prison camp, and the horrors of the Korean War. He always stood strong against dictatorship, for the sake of freedom and democracy, and especially religious freedom. If there is no religious freedom, the humanity will decline. Thus Father Moon was always leading the way in the promotion of religious freedom. Father Moon also taught us to appreciate the value of marriage and family. He, together with Mother Moon, blessed in marriage millions of couples worldwide, calling each to pledge fidelity, true love and devotion to God. By strengthening marriage and family there is hope for the future. In the Sikh tradition, marriage and family are sacred. This is our fundamental teaching. 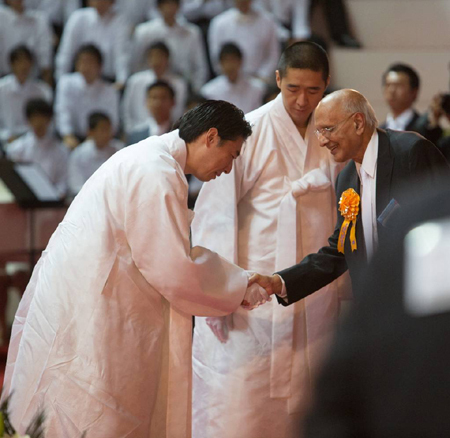 Therefore, Sikhs around the world can understand and appreciate Father Moon’s teaching. Mother Moon, you have visited the United Kingdom's Houses of Parliament and shared the vision of Father Moon. The people of the United Kingdom are grateful for your life of service to the highest and most noble ideals. We gather here today not merely to reflect on the past, but to look to the future. For Father Moon’s legacy is alive and well, and all that he lived and worked for will be carried forward by you, Mother Moon, by your children, and by all of us. Please do not be discouraged. From this day forward I believe we can implement the ideals that Father Moon taught us. In closing I want to say once again how honoured I am to have known Father Moon. To Mother Moon and the entire family I extend my heartfelt appreciation and encouragement as we go forward to build a world of lasting peace. Lord King of West Bromwich is the Patron of the Universal Peace Federation in the UK.